Sometimes fate sweeps in and deals a better hand the second go-around for certain bands. 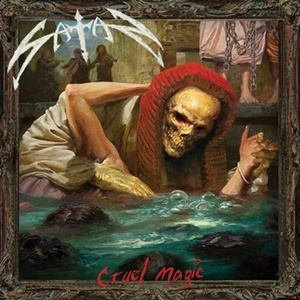 Case in point: the NWOBHM band Satan. Together since 1979, they released a couple of demos and 7” single before their seminal full-length Court in the Act came out in the summer of 1983 on then upstart Roadrunner Records. Many years later regarded as a premiere release, it didn’t exactly set cash registers on fire – causing the band to break up in the late 80’s following a less than ideal follow up Suspended Sentence in 1987. 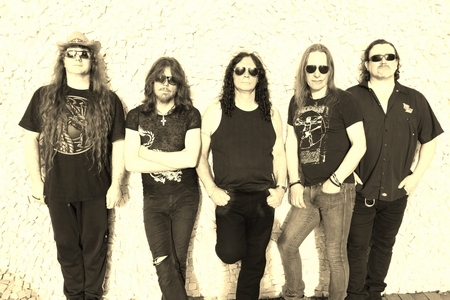 Reunion beckoning from promoters at small to major European festivals got the creative juices flowing again – signing with Listenable and releasing two incredible studio efforts for Life Sentence and Atom by Atom. Enter Metal Blade for a new contract and the band’s fifth studio record with Cruel Magic. And yet again, the band stick to their principles and deliver another fire and brimstone exercise in energetic heavy metal with spirit and integrity. 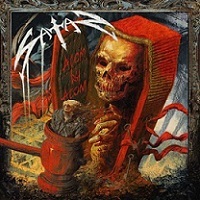 Robust riffing that contains sinister edges along with a combined rhythm section that support those guitar parts through proactive grooves and smart transitions/tempo changes keeps Satan ahead of the pack in a genre that can fall victim to clichés. The tone and nature to the playing for Steve Ramsey and Russ Tippins takes everything from Glenn Tipton/ K.K. Downing steel versatility and adds in the meanness of say Tony Iommi or the darkness of early Mercyful Fate when you check into highlights like “Into the Mouth of Eternity” or “My Prophetic Soul”. When choosing to add acoustic guitars for an intro to “The Doomsday Clock”, it teases out the main speedy proceedings that verge on speed metal with Maiden-like guitar chase sequences against an up-tempo Motörhead-ish backbone and quick hitting fills from drummer Sean Taylor. Sending things to another stratosphere is the upper echelon, helium-high melodies out of Brian Ross – able to leap to the heavens during the chorus of “Legions Hellbound” while matching the moody mid-tempo proceedings during “Ghosts of Monongah” as you feel the racing momentum and sinister shifts which include slide guitar nuances and 70’s throwback bluesy hard rock lead work. The band will never be accused of attempting to become more ‘modern’ – especially when you hear the tones and vintage production qualities at hand for Cruel Magic. They prefer to keep it as live as possible to recreate this material accurate for peak volumes when performing these songs on stage. Since their reformation, they are batting one thousand in baseball terms as far as not tarnishing their reputation and delivering new songs that rival the work of Court in the Act. Rare indeed – so embrace and enjoy.